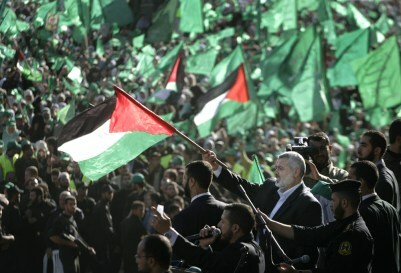 Palestinian Prime Minister of the Hamas, Ismail Haniyeh, waves a Palestinian flag on December 15, 2007. Have a question about the military, terrorism or another national security issue? Selected questions will be answered by MSNBC experts. Hamas’s breakthrough of the barrier between the Gaza Strip and Egypt now presents Israel with a much more complicated situation on its southern border. The tough Israeli measures, which were meant to put pressure on the Hamas-led government, backfired. The Israelis had hoped that the shortages of electricity, fuel and food would force Hamas to take action against the militants responsible for firing dozens of rockets into the Israeli town of Sderot. The rockets, homemade al-Qassam, are the main weapon used by Islamic Jihad. Rather than moving against Islamic Jihad, Hamas chose to alleviate the pressure by demolishing a section of the border with Egypt. Hundreds of thousands of Gazans poured into Egypt to buy virtually everything in the border area. The Egyptian security forces were overwhelmed, but were not inclined to take action in any case. The movement of all these Palestinians into Egypt was not a problem for Israel but it was a problem for Egypt. It was the uncontrolled return of the hundreds of thousands of Palestinians into Gaza that presented a problem for Israel. There is no way for Israeli security to know who entered Gaza and what they may have brought with them. Israel’s concerns are not without merit. Since at least the early 1990s, Iran has been the primary source of money, weapons and training for not only Hezbollah in Lebanon, but also Hamas, primarily in Gaza, and Islamic Jihad, primarily in the West Bank. Originally, that support was routed via Damascus and smuggled via Lebanon or Jordan. In 2005, Israel gave up control of the Gaza-Egypt border to the Palestinian Authority. A year later, Hamas took control the Strip, first by ballot and then by force. Since then, the flow of Iranian supplied weapons into Gaza from Egypt has increased dramatically. According to Israeli intelligence, Hamas and Islamic Jihad received anti-tank missiles, shoulder-fired air defense weapons, which provide a much more lethal capability over the homemade al-Qassam rockets normally fired into Sderot. Ultimately, it was the Israeli pressure on Hamas that led to the current problem. Now the Israelis must find another solution, another way to stop the firing of rockets into southern Israel. After the difficulty the Israeli military faced in southern Lebanon in the summer of 2006, they may be reluctant to launch a military incursion into the densely populated Gaza Strip. The just-released Winograd Commission report criticized the Israeli political and military leadership for failing to stop Hezbollah from firing four thousand rockets into northern Israel over a 32-day period. Thus far, the Israelis have been unable to stop Islamic Jihad from firing rockets into the south. While Gaza is not Lebanon, and neither Islamic Jihad nor Hamas are Hezbollah, the Palestinians now believe they can successfully defend themselves against an Israeli military incursion. The Israeli pressure on Gaza had the unintended consequences of creating a larger problem. This round goes to Hamas, but Israel may believe that the military option is the only option and now faced with the uncertainty of what new weaponry or fighters may have entered Gaza during the period of the uncontrolled border. Given the stinging Winograd findings, if the Israelis decide to use force, they will not repeat the mistakes of southern Lebanon in 2006.